"I'm very pleased to announce that we've had a breakthrough in negotiations in Honduras. I want to congratulate the people of Honduras as well as President Zelaya and Mr. Micheletti for reaching an historic agreement. I also congratulate Costa Rican President Oscar Arias for the important role he has played in fashioning the San Jose process and the OAS for its role in facilitating the successful round of talks. As you know, I sent Assistant Secretary Tom Shannon and his deputy Craig Kelly and the White House NSC representative for the Western Hemisphere Dan Restrepo to Honduras yesterday after speaking with both President Zelaya and Mr. Micheletti last Friday to urge them finally, once and for all to reach an agreement. I cannot think of another example of a country in Latin America that having suffered a rupture of its democratic and constitutional order overcame such a crisis through negotiation and dialogue. This is a big step forward for the Inter-American system and its commitment to democracy as embodied in the Inter-American Democratic Charter. I'm very proud that I was part of the process, that the United States was instrumental in the process. But I'm mostly proud of the people of Honduras who have worked very hard to have this matter resolved peacefully. We're looking forward to the elections that will be held on November 29, and working with the people and government of Honduras to realize the full return of democracy and a better future for the Honduran people." Exactly what some of us have been saying all along - that Washington played the coup out as long as possible, trying to gain legitimacy and credibility for the dictatorial regime, but when that strategy failed, and the United Nations, OAS and countries around the world still refused to recognize the illegal regime as a "government" and further reiterated over and over again that the upcoming presidential elections on November 29th would not be recognized, the Obama/Clinton team went for Plan B. The past few days have been a rush to figure out a way to get President Zelaya "placed" back in "power", but with no power to govern, just his cowboy hat in the presidential office, so that the elections could proceed. And so Washington sent down it's heavy duty delegation on Wednesday, led by Sub-Secretary of State for Latin America Thomas Shannon, National Security Council Advisor on Latin America Dan Restrepo, and Adjunct Secretary of State Craig Kelly (a fanatical anti-Chávez propagandist). The trio "resolved" the four month long Honduran crisis. Washington to the rescue! Right. Basically, the Empire's trio went down to their backyard and told dictator Roberto Micheletti that if he didn't just allow Zelaya's cowboy hat back in the presidential office, Washington wouldn't recognize the upcoming elections and that could be a problem for the small Central American nation. And, they said, don't worry, Zelaya won't be able to do anything anyway, it's all for show. So, Micheletti bowed his oversized ego and said, well, ok, let the Congress decide (the same Congress that approved the coup d'etat on June 28th), and so long as I go free. The "agreement" lauded by Clinton merely says the Honduran Congress will decide on Zelaya's restitution, and if approved, a government of "reconciliation" will be installed. Read: puppet regime with no power. Washington is overjoyed and excited about having found a way to save face and look like the good guys! But what about the people of Honduras who have suffered four months of repression and violence from the coup regime and the armed forces at its service? What about the US military presence on Soto Cano that have been coordinating with the coup leaders from day one? What about the four months lost from Zelaya's presidency? And justice for the people? That's not in the "historic agreement". Thomas Shannon said he was pleased that an agreement was reached to resolve the crisis in Honduras "without violence". What about the dozens killed and hundreds injured and detained over the past four months at the hands of the coup regime? And the constant suspension of constitutional rights and guarantees? Is that not "violence"? We still have to wait and see how the situation plays out. But without real justice for the people of Honduras, this "historic agreement" is just a bunch of Washington hype. The Obama-era Empire is increasing its attacks on Latin America. This week brings several new developments. Republican congressman Connie Mack (FL), known for his rabid anti-Chávez stance, introduced - yet another - resolution before the House of Representatives to declare Venezuela a "state sponsor of terrorism". “Mr. Chairman, I was a vocal critic of the Bush Administration in their hands-off approach to Chavez. I believe that by failing to confront Chavez that we left a vacuum. The Obama Administration must take the dangers of Hugo Chavez seriously. We must confront the Chavez-Ahmadinejad alliance and not wait until it’s too late." “Today, in a bipartisan manner, I introduced a resolution with my good friend, Congressman Ron Klein, that calls on the Administration to designate Venezuela as a state sponsor of terrorism. Venezuela is a danger that cannot be overlooked, Mr. Chairman." Last year, the Bush Administration tried to do the same thing, but failed. For one reason: they can't get the oil and declare Venezuela an "enemy nation". So, Mack's resolution probably won't go anywhere, but still it reinforces an ongoing line of opinion about Venezuela, and President Chávez in particular, as "terrorist" and all around evil. Mack even brings in the ridiculous case of a Los Alamos nuclear physicist who was searched by the FBI last week and, in an attempt to get off the hook, scapegoated Venezuela in the weirdist of ways. Leonardo Mascheroni, an Argentinean nationalized in the US and a former Los Alamos National Laboratory researcher, told the FBI that he received "$20,000 in cash, and had expected another $800,000, for a report that consisted of "unclassified materials found on the Internet." He said he hoped his work would persuade the Venezuelan government -- represented by a man he knew as "Luis" -- not to pursue a nuclear-weapon program and provide him with funding for research on nuclear fusion." That's so strange, because just a couple of years ago in Argentina, another "FBI informant", Guido Antonini, a Venezuelan and US citizen, got busted with a suitcase full of $800,000 cash, which he later tried to say Chávez had told him to give to Cristina Fernandez de Kichner for her presidential campaign. Seems like $800,000 is a common figure for made-up scandals to try and classify the Venezuelan government as both dangerous and corrupt. Couldn't at least one of them come up with a different figure? I mean, really. The Antonini "suitcase" scandal was set up by the FBI and was a very, very weak attempt to pull Chávez into some kind of international money laundering conspiracy. No ties to the Venezuelan government were ever evidenced legally. Lots of stuff was made up so the US could get involved and actually prosecute several Venezuelans - non government officials, and friends and business partners of Antonini - today several are in prison in Miami. Yeah, and terrorist Luis Posada Carriles is free. Anyway. A high level State Department and White House delegation is in Honduras today. Subsecretary of State Thomas Shannon, Assistant Secretary of State Craig Kelly and National Security Council Advisor on Latin America, Dan Restrepo, have headed down to Tegucigalpa to "put and end to the crisis, once and for all". Yeah right. They really are there trying to figure out the best way to legitimate the scheduled upcoming presidential elections on November 29th. The coup d'etat against President Zelaya occurred 4 months ago. The repressive regime in place since then, led by Roberto Micheletti, refuses to step down from power. Zelaya continues to remain harbored in the Brazilian Embassy in the Honduran capital. Meanwhile, Clinton spoke to Micheletti on Saturday and agreed to talk to the Defense Department about letting him have access to some of the Pentagon's radars that are stationed throughout Honduras, in order to detect "foreign invaders". So, they really are working together after all. The United States continues to be one of the only regional nations still maintaining diplomatic relations with the coup regime in Honduras. As State Department spokesman Ian Kelly confirmed yesterday, the US Ambassador in Tegucigalpa, Hugo Llorens, is in constant contact with Micheletti. No surprise. Washington had full knowledge of the coup before it happened, funded those actors involved, aided militarily - the US military base in Soto Cano (Palmerola), Honduras, was used to transport President Zelaya forcefully out of the country on the morning of the coup - and the US has continued to fund both the illegal regime and the Honduran military. Commercial ties have remained in tact between Washington and Honduras and no action - literally no action - has been taken by Washington to really pressure the regime. From day one, the Obama administration's stance has been to "let it all just play out" - that position has allowed for countless deaths, injuries, persecutions, tortures and violations of human rights to occur. We are not asking the US to intervene, we are asking the US to STOP intervening by pulling out its military forces and funding, and by ceasing the constant flow of cash to the coup regime and its supporters, via USAID, National Endowment for Democracy (NED) and State Department funding. The elections on November 29th cannot be allowed to take place in this environment. The only viable solution that brings justice to the people is to bring down the coup regime and then convene a constitutional assembly to create a new political-social-economic structure for the country. This Friday, Colombia and Washington seal the deal allowing for the largest US military presence in Latin America ever. The agreement will permit the US to occupy 6 additional military bases in Colombia (it already occupies three) and will allow US military and security forces, including contractors, to US all Colombian military and police installations throughout the entire country, basically converting Colombia into one big US military base. Neighboring countries, such as Ecuador and Venezuela, have expressed grave concern over this excessive US military presence in the region. The agreement stipulates that the purpose behind the military expansion is to combat "drug trafficking, terrorism and regional threats", and to guarantee "security and democracy" in the region. Considering the efforts of the US to relate Venezuela to both terrorism and drug trafficking, our concerns are accurate. Just yesterday, the Venezuelan government caught several Colombian intelligence agents spying inside Venezuelan territory. This will increase once the US further digs itself into South America. As someone who has spent the last decade investigating, studying and analyzing day by day Washington's actions towards Latin America, I have to say, things in the Obama-era are much worse. The aggression is increasing at a rapid pace and most people still seem deceived by Obama's happy face and teleprompter poetry. People in the US should demand that the billions of dollars going into threatening the peoples of Latin America should be used to provide housing and health care in the US. Then we could be talking about some real change. The New York Times did a "story" today on my reaction to Michael Moore's fairy tale about meeting with President Chávez in Venice this past September. The article, written by Simon Romero, was published in both the print and online editions of one of the world's most important newspapers. I wrote my "reaction" to Moore's ridiculous made up cover story about Chávez one week ago, and since then, really nobody is talking about this anymore. No one from the government reacted and yes, the opposition media had fun with the whole thing, but really, what makes this a New York Times worthy issue?? I mean really, of all the things to write about, Simon, come on! Of course the NYT is not covering the millionth patient attended to as part of Misión Milagro (Miracle Mission), the social program created by Cuba & Venezuela to provide free surgeries to those suffering from eye diseases and problems. Nor did the NYT cover last week's inauguration of the brand new modern and highly advanced geneology research center and diagnostic treatment clinic- providing 100% free care to everyone. Considering the US is ongoing a huge debate about health care services, you would think these stories would be inspirational and much more newsworthy than me & Michael Moore and a bunch of ridiculous lies - or jokes, whatever you want to call them. But no, the NYT found the battle of the left much more exciting than major healthcare advances, and uniform coverage, for all Venezuelans, even at the most advanced treatment levels. And so, Moore responded, finally, (and again, cowardly) with a bunch of twits or tweets or whatever, at least admitting that President Chávez "doesn't drink", but still, calling me out for having lost my sense of humor. So, after receiving too many messages to count from many readers and observers telling me I have no sense of humor and to leave Moore alone, he was just joking and anyway, is already so attacked by the right-wingers, poor guy. But still, I hold strong to my original opinion about his "joke", which personally I found misplaced, inappropriate and in very bad taste. It's easy to make fun of a Latin American president who is already the most demonized in US media and ridiculed internationally. It's much easier to make jokes about Chávez than tell the truth. Because almost nobody is willing to step out and risk being associated with a controversial figure like President Hugo Chávez, whether or not you secretly adore him, or like what is happening in Venezuela. Those who do are constantly attacked and threatened and harassed. Yeah, Moore is too, but this time around, he decided it wasn't "convenient" to be seen with Chávez. All I'm saying is, if you have 5 minutes on national television in the US to talk about Venezuela or President Chávez, and you care or believe in the incredible changes and movements taking place in Venezuela and throughout Latin America, and you're talking about one of the world's most demonized and threatened leaders, at least say something - one thing - redeeming. One positive thing. One. But to use the gift of 5 minutes before millions of viewers who know little or nothing - or care little or nothing - about Venezuela and Chávez to make jokes and ridicule an already overly-ridiculed leader, it just doesn't do it for me. We have had a coup d'etat in Venezuela, funded and designed by the Department of State and the CIA, numerous economic sabotages causing billions of dollars in damages to the economy, we have an ongoing, severe media war, paramilitary infiltration causing death and violence throughout the country - coming from neighboring Colombia where the US not only has invested almost $10 billion during the past 10 years in Plan Colombia, but also just entered into an agreement with the Colombian government to utilize 6 more Colombian military bases for US operations in the region and to allow US military and security forces FULL ACCESS to all Colombian military and police installations...There have been several, documented assassination attempts against Chávez during the past few years, and just last year, the US Government tried to place Venezuela on the list of "state sponsors of terrorism", but it didn't happen because they couldn't figure out - yet - how to still get the oil if we are truly classified as enemies. And not to mention the complete absence of any information in US media about the achievements of the Bolivarian revolution and President Chávez's policies during the past ten years, which have resulted in free health care coverage for all 27 million Venezuelans; the eradication of illiteracy and the guarantee of all levels of education, from basic to graduate level, for free to all Venezuelans; the recuperation of national sovereignty and national industries, such as oil, in order to redistribute the wealth and attempt to reduce and eliminate poverty - to date extreme poverty has been reduced more than 30% in the past decade, under Chávez. Worker-run factories, cooperatives, community councils, indigenous people's land and language rights, women's institutes and banks, community banks, free distribution of books and reading materials, inclusion of national artists and culture in all aspects of government and social policies, and the list is endless, practically, of incredible advances and achievements on a social and economic level in Venezuela during the past 10 years. 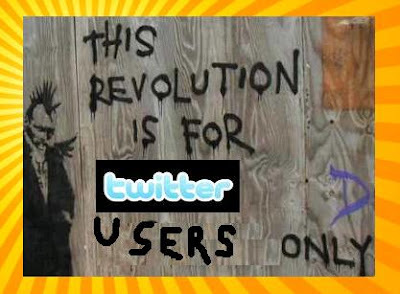 Millions of people previously invisible are now visible. Participation in every aspect of Venezuelan society - political, economic, social and cultural - is at almost a 100%. People feel that what they do, matters. These changes are absolutely extraordinary, and untold. So, excuse my apparent "lack of humor", but Michael Moore could have at least taken one minute to say one thing good about Venezuela and Chávez, instead of doing what all those who want to diminish and devalue what is happening here always do - ridicule and make fun of Chávez, and manipulate and distort the facts. So Michael, come and present "Capitalism: A Love Story" here in Caracas, with us, and hold your head high. En una noticia exclusiva publicada esta semana en la revista WIRED, fue revelada que In-Q-Tel, una empresa inversionista de la Agencia Central de Inteligencia de Estados Unidos (CIA), acaba de hacer grandes inversiones en un negocio dedicado a monitorear los medios y redes sociales. Esta empresa, Visible Technologies, vigila cada día más de medio millon de sitios en internet, revisando más de un millon de conversaciones, foros y posts en diferentes blogs, foros en línea, Flickr, YouTube, Twitter y Amazon. Los clientes de Visible Technologies reciben información en tiempo real sobre lo que se está diciendo y haciendo en el ciberespacio, basada en una serie de palabras claves. El vocero de Visible Technologies, Donald Tighe, reveló que la CIA les pidió monitorear a los medios sociales extranjeros e instalar un sistema de “deteción temprana” para informar a la agencia de inteligencia sobre “cómo los asuntos de interés se están manifestando a nivel internacional”. Pero también, se utiliza a nivel nacional, dentro de Estados Unidos, para monitorear a los bloggers y tweeters domésticos. Hace una semana, el Departamento de Estado patricinó un evento en la Ciudad de México llamado la Cumbre de la Alianza de Movimientos Juveniles, reuniendo jóvenes dirigentes políticos afínes a los intereses de Washington con los fundadores y representantes de las nuevas tecnologías como Facebook, Twitter y YouTube. La Alianza buscaba “mejorar la capacidad de los jóvenes políticos para utilizar las nuevas tecnologías para mobilizar sus organizaciones y diseminar información a un público masivo.” Participaron varios dirigentes opositores de Venezuela, como Yon Goicochea y Geraldine Álvarez, conocidos por sus vínculos a las agencias de Washington desde hace unos años. También asistieron, por invitación del Departamento de Estado, los promotores de la marcha “No Más Chávez” que fue convocada en Facebook durante el mes de septiembre 2009. Ahora, con la nueva evidencia sobre las últimas inversiones de la CIA que permiten el monitoreo y rastreo de información en Twitter, blogs, YouTube y otros foros en ciberespacio, no hay duda de que el campo de batalla ha sido ampliada. Sin embargo, la comunidad de inteligencia no controla – aún – todo el contenido y flujo de información en el ámbito cibernético. Y las mismas herramientas que les sirven a ellos para minar data y obtener información sobre sus potenciales adversarios, pueden ser utilizadas por aquellos que luchan contra las intrusiones imperiales como armas para mobilizar masas y diseminar verdades sobre sus agresiones. Durante los días 15 y 16 de octubre de 2009, la Ciudad de México es la sede de la segunda Cumbre de la Alianza de Movimientos Juveniles (“AYM” por sus siglas en inglés). Patrocinado por el Departamento de Estado, el evento cuenta con una oradora de lujo –vía Internet- la Secretaria de Estado Hillary Clinton. Adicionalmente, hay varios “delegados” invitados por la diplomacia estadounidense, incluidos personajes vinculados con movimientos de desestabilización en América Latina. Los nombres que figuran en la lista de participantes incluyen a los venezolanos Yon Goicochea (Primero Justicia), el dirigente de la organización Venezuela de Primera (grupo fundado por Goicochea), Rafael Delgado, y la ex dirigente estudiantil Geraldine Álvarez, ahora miembro de la Fundación Futuro Presente, organización creada por Yon Goicochea con financiamiento del Instituto Cato de Estados Unidos. También asisten Marc Wachtenheim de Cuba Development Initiative (proyecto financiado por el Departamento de Estado y la USAID a través de la Fundación del Desarrollo Panamericana “PADF”), Maryra Cedeño Proaño, de la Corporación Foro de la Juventud Guayaquil, entidad ecuatoriana financiada por la USAID, y Eduardo Ávila de Voces Bolivianas, organización promovida por la embajada de Estados Unidos en Bolivia con financiamiento de la USAID. Son 43 delegados en total, de países de todo el globo, de Sri Lanka, la India, Canadá, Reino Unido, Colombia, Perú, Brasil, Líbano, Arabia Saudí, Jamaica, Irlanda, Turquía, Moldavia, Malasia, Estados Unidos y México. Los panelistas y patrocinadores son una extraña mezcla de representantes de las nuevas tecnologías y funcionarios de las agencias de Washington, especialistas en la subversión y desestabilización de gobiernos no subordinados a su agenda. Oradores de Freedom House, el Instituto Republicano Internacional (IRI), el Departamento de Estado y el Banco Mundial figuran en la agenda de la cumbre, junto con jóvenes creadores de tecnologías como Twitter, Facebook, Google, Gen Next, Meetup y Youtube. Los únicos medios tradicionales invitados al evento por el Departamento de Estado son CNN en Español y CNN en inglés, dato curioso que evidencia su estrecha relación. Sin duda, esta unión entre las agencias de Washington, las nuevas tecnologías y los jóvenes dirigentes políticos seleccionados por el Departamento de Estado, es una receta para una nueva estrategia de “cambiar regímenes”. Además, este evento reafirma el apoyo político y financiero al movimiento estudiantil de la oposición en Venezuela por parte de Estados Unidos y coloca ante la opinión pública una evidencia irrefutable de la siniestra alianza entre Washington y las nuevas tecnologías. ¿Sus objetivos? ¿O los objetivos de Washington? Una de las primeras operaciones exitosas de la Agencia Central de Inteligencia (CIA) en los años cincuenta y sesenta fue la creación del Congreso por la Libertad de la Cultura en Europa para impregnar y utilizar los espacios de arte, las universidades, los intelectuales y los movimientos sociales para neutralizar la expansión del comunismo. El uso de la cultura para promover la agenda imperial no terminó después de la Guerra Fría. Mientras crece la adicción a la tecnología, este eficaz mecanismo está siendo refinado y aplicado. Nuevas tecnologías como Facebook y Twitter, desarrolladas con financiamiento de empresas de la CIA como In-Q-Tel, especialista en la “minería de data”, hoy en día funcionan como redes para reclutar y captar “agentes” dispuestos a promover los intereses imperiales. El uso potencial de estas tecnologías para promover operaciones psicológicas y propaganda es ilimitado. Su fuerza es la rapidez de la diseminación de los mensajes y su cobertura mundial. Sólo hacía falta diseñar la estrategia que permitiría alcanzar ese potencial. “La Alianza de Movimientos Juveniles (AYM) es la respuesta a esa necesidad. Comenzó con una reunión cumbre en diciembre de 2008, en la cual el Departamento de Estado se asoció con MTV, Google, YouTube, Facebook, Howcast, AT&T, JetBlue, GenNext, Access360Media y la Facultad de Derecho de Columbia University para reconocer y convocar a los movimientos del siglo XXI y dialogar con ellos por Internet por primera vez en la historia”. Durante la primera cumbre de la AYM, participaron miembros de la organización opositora venezolana Súmate (financiada por la NED y USAID), y los creadores colombianos de las marchas “No más Chávez” y “Un millón de voces contra las FARC”. Los principales panelistas eran tres asesores de la campaña de Barack Obama para la presidencia, incluidos Joe Rospars, director de Nuevos Medios de la campaña, Scott Goldstein, director en línea de Obama para América, y Sam Graham-Felson, director de blogging para la campaña Obama 2008. También participaron Sherif Mansour, de Freedom House, Shaarik Zafar, asesor del Departamento de Seguridad Interior de Estados Unidos (Homeland Security) y ocho altos funcionarios del Departamento de Estado, junto a representantes de diferentes multinacionales de la comunicación y las nuevas tecnologías. Los creadores de la exitosa campaña “súper-tecnológica” de Obama se juntaron con las agencias de Washington para diseñar la estrategia perfecta. Combinaron dos fuerzas novedosas en la política -la juventud y las nuevas tecnologías-. Era una combinación capaz de lograr lo que durante varios años le habían dificultado a la CIA: el cambio de régimen en países no subordinados a los intereses de Estados Unidos, sin que apareciera la mano de Washington. El movimiento estudiantil “manos blancas”, en Venezuela, financiado y formado por las agencias estadounidenses, las protestas anticomunistas en Moldavia, las manifestaciones contra el gobierno iraní y las últimas protestas virtuales contra el Presidente Chávez son ejemplos de esta nueva estrategia. Las nuevas tecnologías –Twitter, Facebook, YouTube y otras– son las principales armas, y los medios tradicionales, como CNN y sus afiliados, ayudan exagerar el impacto real de estos movimientos promoviendo matrices de opinión falsas y distorsionadas sobre su importancia y legitimidad. La Alianza de Movimientos Juveniles es otro capitulo más dentro de los planes de desestabilización contra países soberanos antiimperialistas que rechazan la dominación imperial. La doble moral de Washington reafirma este hecho. Mientras que el Departamento de Estado promueve, financia y patrocina la formación de jóvenes de otros países en el uso de las nuevas tecnologías para desestabilizar sus gobiernos, el uso de Twitter y Facebook para convocar protestas contra las políticas de Washington dentro de Estados Unidos se criminaliza. Así se demostró hace tres semanas cuando dos ciudadanos estadounidenses fueron arrestados por utilizar Twitter para informar a los manifestantes contra la cumbre G-20 en Pittsburgh sobre las acciones represivas de la policía. In an interview last October 9th on Jimmy Kimmel Live!, the renowned and award-winning documentarian, Michael Moore lied vulgarly about his encounter with Venezuelan President Hugo Chávez during the Venice Film Festival this past September. In the interview, Moore responds to Kimmel’s request for an explanation of a photo of Moore with President Hugo Chávez. Apparently embarrased about the encounter with one of Latin America’s most prominent and influential heads of state, Moore proceed to completely make up a fairy-tale, attempting to pass it off as reality. With a straight face, Moore stated he met President Chávez at 2 o’clock in the morning, after he and his wife had settled into bed in their Venice hotel room and heard a scandalous noise coming from the floor above. Moore states that he called down to the reception to find out “what the hell was going on”. “It’s the president of Venezuela”, the hotel clerk allegedly told Moore. Well, Michael couldn’t believe it, so despite his wife telling him “don’t go”, Moore set out, determined to find out if the true source of the scandal was really the Venezuelan president, the polemic Hugo Chávez. Incrediously, Moore says he went upstairs and knocked right on Chávez’s door and a large man answered, who Moore claims was the president’s “bodyguard”. Chávez was right behind him and caught a glimpse of Moore and yelled out “Michael Moore, come on in!”. Anyone who has ever traveled or been close to President Chávez knows very well that it is absolutely impossible to just “go knock on his door”. Presidential security lines the hallways, elevators and all entrance points. Take it from someone who knows first hand. Moore’s story is complete and utter fiction. Also the man Moore identified in the interview as Chávez’s “bodyguard” is actually Foreign Minister Nicolás Maduro, but hey, all latinos look alike! The tale continues. Moore says he entered the room and a “bottle and a half of tequila later”, he was writing Chávez’s speeches! Of course, Michael, all of us Latin Americans drink tequila! Man, he couldn’t even get his alcohol right in his fairy tale! Tequila is Mexican, Michael. Venezuela makes rum. Get it straight. And anyway, President Chávez does not drink at all and is well known for his anti-alcohol position. But in Moore’s story, latinos are all a bunch of partiers! No work, just party, drinks and fun at 2am! Moore is exceptionally full of himself towards the end of the interview with Jimmy Kimmel. He says Chávez asked him for advice about his upcoming United Nations speech. Moore sternly told the South American president to “say sorry for calling Bush the devil, “el diablo”” during his last UN intervention. And to say this time around it’s all about the “hope”! Way to defend Bush, Michael! Wait, didn’t you write, direct and film Farhenheit 9/11? Right, but when someone “non-US” tells it like it is, you get way patriotic. I get it. The interview ended with Michael fully praising himself for yet another one of President Chávez’s brilliant United Nations’ speeches. “When I heard the first few lines of his speech”, says Moore, “it was exactly what I had written for him!” Michael, Michael. Don’t you know that Chávez doesn’t use a teleprompter? Where we come from, speeches are made from the heart and soul, and not written by an elite team of 20 writers and then read from transparent screens. And Michael, do you really think that flattering yourself at this point, after you have lied so tremendously, is appropriate? Arrogantly, Moore joked that Chávez should give him a “year of free gasoline” for writing his speech. At least he didn’t say bananas. ”no cameras” document his meeting with President Chávez in Venice, the official Venezuelan presidential press snapped a few photos, and there were many witnesses. The photographs evidence a Michael Moore and a President Chávez serenly sitting in two chairs talking. No tequila, no parties, no scandals, just a normal meeting between a head of state and an invited guest. In fact, the real meeting lasted three hours, without tequila. Michael Moore prohibited cameras in the meeting because, per his own words, it wasn’t “convenient” for him to been seen with Chávez. Despite the fact that every presidential meeting has been documented by the official press, this time, they defered to Moore with respect. He was, after all, an admired figure by millions of Venezuela. But, the presidential press was able to capture a few photos of the encounter. 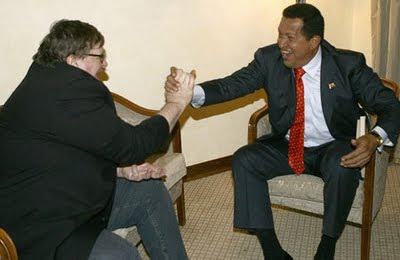 These photos now are the key evidence to expose Michael Moore’s vulgar lies about his meeting with President Chávez. Moore’s comentaries about President Chávez asking him to “help” write his United Nations speech demonstrate Moore’s extreme ego. President Chávez is one of the most brilliant speakers in the world, with an immense capacity to bring together a variety of ideas while being coherent. Of course, Chávez nourishes his speeches and talks with ideas, experiencies and the writings of many, but for those of us who spend almost every day listening and watching President Chávez, we know that nobody writes his speeches, not even him! He speaks from his heart, and not from a teleprompter! Moore’s response to this admiration, acclaim and support is to lie and ridicule President Chávez and the people of Venezuela, and to attempt, lamely, to justify his meeting with Chávez. Because in the end, this whole ridiculous tale told by Moore about his “meeting” with President Chávez is an attempt to avoid admitting before the US media that he met for three hours with the South American “dictator”. And he probably learned a lot, and liked it! Michael Moore is a most unfortunate coward. NY TIMES ON US LOBBYISTS HIRED TO GET SUPPORT FOR HONDURAN COUP REGIME - DEMS & REPUBS! WASHINGTON — First, depose a president. Second, hire a lobbyist. In the months since soldiers ousted the Honduran president, Manuel Zelaya, the de facto government and its supporters have resisted demands from the United States that he be restored to power. Arguing that the left-leaning Mr. Zelaya posed a threat to their country’s fragile democracy by trying to extend his time in office illegally, they have made their case in Washington in the customary way: by starting a high-profile lobbying campaign. The campaign has had the effect of forcing the administration to send mixed signals about its position to the de facto government, which reads them as signs of encouragement. It also has delayed two key State Department appointments in the region. Costing at least $400,000 so far, according to lobbying registration records, the campaign has involved law firms and public relations agencies with close ties to Secretary of State Hillary Rodham Clinton and Senator John McCain, a leading Republican voice on foreign affairs. It has also drawn support from several former high-ranking officials who were responsible for setting United States policy in Central America in the 1980s and ’90s, when the region was struggling to break with the military dictatorships and guerrilla insurgencies that defined the cold war. Two decades later, those former officials — including Otto Reich, Roger Noriega and Daniel W. Fisk — view Honduras as the principal battleground in a proxy fight with Cuba and Venezuela, which they characterize as threats to stability in the region in language similar to that once used to describe the designs of the Soviet Union. “The current battle for political control of Honduras is not only about that small nation,” Mr. Reich testified in July before Congress. “What happens in Honduras may one day be seen as either the high-water mark of Hugo Chávez’s attempt to undermine democracy in this hemisphere or as a green light to the spread of Chavista authoritarianism,” he said, referring to the Venezuelan president. Mr. Noriega, who was a co-author of the Helms-Burton Act, which tightened the United States embargo against Cuba, and who has recently served as a lobbyist for a Honduran business group, declined to comment for this article. Mr. Reich, who served in key Latin America posts for President Ronald Reagan and President George W. Bush, said he had not lobbied officially for any Honduran group. But he said he had used his connections to push the agenda of the de facto government, led by Roberto Micheletti, because he believed that the Obama administration had made a mistake. And Mr. Fisk, whose political career has included stints on the National Security Council and as a deputy assistant secretary of state for Western Hemisphere affairs under Mr. Bush, had been promoting the Micheletti government’s case until two weeks ago as an aide to retired Senator Mel Martinez of Florida. In addition to the support of such cold war veterans — and partly because of it — the de facto government has mobilized the support of a determined group of Republican legislators, led by Senator Jim DeMint of South Carolina. They are holding up two State Department appointments as a way of pressing the Obama administration to lift sanctions against the country. Chris Sabatini, editor of Americas Quarterly, a policy journal focusing on Latin America, said the lobbying had muddled Washington’s position on the coup. The administration has said publicly that it sees the coup in Honduras as a dangerous development in a region that not too long ago was plagued by them, he said. But, he added, to placate its opponents in Congress, and have its nominations approved, the State Department has sometimes sent back-channel messages to legislators expressing its support for Mr. Zelaya in more equivocal terms. 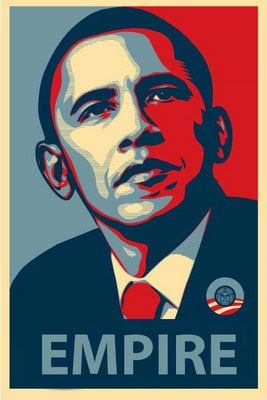 After the June 28 coup, President Obama joined the region in condemning the action and calling for President Zelaya to be returned to power, even though the Honduran president is an ally of Mr. Chávez, America’s biggest adversary in the region. But Congressional aides said that less than 10 days after Mr. Zelaya was ousted, Mr. Noriega and Lanny J. Davis, a confidant of Mrs. Clinton and a lobbyist for a Honduran business council, organized a meeting for supporters of the de facto government with members of the Senate. Mr. Fisk, who attended the meeting, said he was stunned by the turnout. “I had never seen eight senators in one room to talk about Latin America in my entire career,” he said. As President Obama imposed increasingly tougher sanctions on Honduras, the lobbying intensified. The Cormac Group, run by a former aide to Senator McCain, John Timmons, signed on, records show, as did Chlopak, Leonard, Schechter & Associates, a public relations firm. As is often the nature of lobbying, some messages have been sent without any names attached. Floating around Senate offices in the last few weeks, for example, was a list of talking points aimed at undermining the nomination of Assistant Secretary of State Thomas A. Shannon as ambassador to Brazil. Two Congressional aides, who requested anonymity to speak candidly about matters related to the coup, said that Mr. Fisk wrote the talking points. 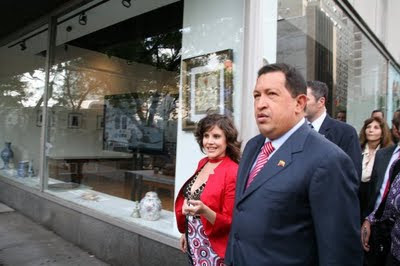 (more photos from Chávez's trip to the UN in NYC here.